Our POP Display Gallery shows only a sample of the custom displays Avante has created to assist customers with better retail placement. You’re busy enough as it is. 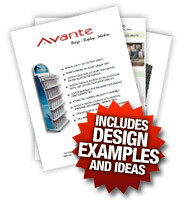 At Avante we are committed to providing outstanding, knowledgeable service and solutions to help complete your POP display project, so you can get on with the rest of your hectic day. Avante specializes in custom point of purchase displays and point of sale displays, which help you with better retail placement. We recognize each customer’s unique needs and expectations. Find out more about creating a custom POP display.